With a certain project structure, it's not possible anymore to create a project out of Maven poms with IDEA 7.0.2, even though it worked as expected in 7.0.1. There are two Maven projects A and B that both depend on a 3rd Maven project, called C. Nothing spectacular yet. Additionally, there is a multi module Maven project defined to build A (ABuild) and another multi module Maven project that builds A and B (ABBuild). The complete project structure together with dummy source files is attached as a zip file (test.zip). On the command line both ABuild and ABBuild can be built using Maven, so the structure is perfectly valid. 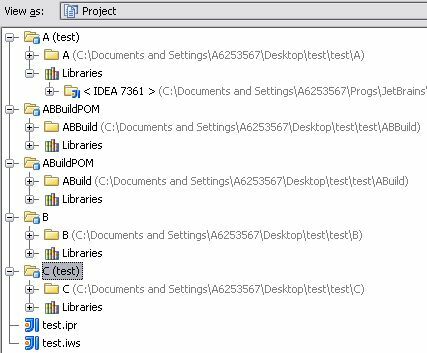 It is possible to create an IDEA project out of this with release 7.0.1 by pointing to the "test" folder in the respective dialog. The result what 7.0.1 sees when scanning the test folder is shown in 701_import.GIF. After leaving all projects selected, the project is created and looks like in screen shot 701_project.GIF. Trying the same thing with 7.0.2 fails: this release already sees less projects when scanning the test folder. This is shown in 702_import.GIF. Clicking "Next" in this dialog then leads to an error message (see 702_error.GIF) and a project isn't created. As already mentioned we're facing this problem in a real world scenario and right now we can't use the 7.0.2 release here. 7.0.1 on the other hand has a number of other Maven related bugs (and others that are relevant for us) that were fixed in 7.0.2, but apparently the fixing broke something else here. Any comments, hints or bug fixes would be very appreciated. Can anybody from jetbrains comment on this bug? Should I create a JIRA ticket or is there an intention behind the change in behaviour between 7.0.1 and 7.0.2? 100 views in 10 days, yet no response from Jetbrains. I just tested on my 7656 new install ant it seems to be working correctly. Indeed, the New project wizard shows only the poms with packaing=pom, but all the 5 projects are imported as modules, resulting in the illustrated screenshot. With 7656 the import appears to work. I still find it somehow strange that it worked in 7.0.1, was broken in 7.0.2 and now in an EAP version works again, but different than in 7.0.1. Especially since the release notes for 7656 don't mention this bug as being fixed. I wonder how the behaviour will be in the next EAP or eventually in 7.0.3? I just noticed that now in each Maven module an .iml file is generated. The choice between generating regular or temporal project files is gone. What's the strategy behind that? Will the Maven settings be auto-synchronized in the future or will I have to ensure that manually (like it was until 7.0.2 when having iml files). The release notes for 7656 don't say anything related to that. A little bit more communication of how the Maven integration is changed currently and in the future would be appreciated. i've seen a message from jetbrains people saying this setting was confusing and they were removing it. It looks like the automatic project synchronization was removed as well - that feature was certainly not confusing, because Eclipse and Netbeans do have it since months already. IDEA finally catches up with this functionality in 7.0 only to get it removed without any comment in a 7.0.3 EAP - that is really weird! Maybe finally somebody from Jetbrains can explain the rational behind it and state what the future strategy regarding Maven integration looks like. For us, having seamless Maven integration was the main reason for updating to 7.0 - if now in a service release major functionality gets ripped out with the explanation that it was too confusing then I simply can't understand that. you may rant as much as you want, but from my own experience (and hearing my eclispe's coworkers swearing all day long about it), maven integration with Eclipse is not working right either, especially for web modules. I personnaly have no problem with how IDEA's integration works : been working with it for months, and it has constantly improved.